No keia heiau oia ke kapu enaena. Oral traditions trace the origin of Hawaiian luakini temple construction to the high priest Pā’ao, who arrived in the islands in about the thirteenth century. He introduced several changes to Hawaiian religious practices that affected temple construction, priestly ritual, and worship practices. Prior to his coming, the prayers, sacrifices, and other ceremonial activities that the high chief and his officiating priest performed could be observed by the congregation, who periodically responded as part of the ceremony. After Pā’ao’s arrival, temple courtyards, which were sometimes built on hillsides to add to their massiveness, were enclosed with high stone walls, preventing the masses from participating as freely in the worship ceremonies. Beyond the heiau, on the makai side of the trail, is pointed out the footprint of Niheu, a demi-god, as well as the mark of an arrow which he shot at another demi-god who came to fight him. Further west, makai of the place where the trail turns mauka, is Kamoamoa, where the ranch driving pens are. Here are two wells with fair water, and also a fine natural arch by the sea. Here are also a few interesting rock carvings. The most easily found of these is about a hundred yards from the paddock extension towards Kalapana, and may be located by following the line of this extension’s makai wall in an easterly direction. Kīlauea’s ongoing Puʻu ʻŌʻō eruption started on January 3, 1983 when ground fissures opened up and “curtains of fire” (long thin fountains of molten lava) issued from a 3½-miles long discontinuous fissure system in the remote rainforest of the middle east rift zone of the volcano. Since then, about 500-acres have been added to the Big Island (that volume of lava could have filled 1.5-million swimming pools. The coastal highway has been closed since 1987, as lava flows covered 8 miles to as great a depth as 80 feet. 214-homes were destroyed. 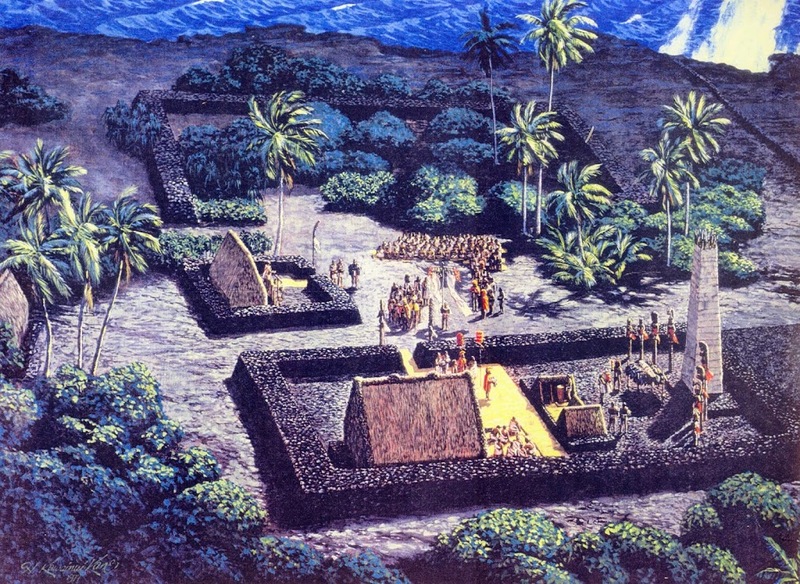 The image shows a drawing of Wahaʻula Heiau. (HerbKane) In addition, I have added other images in a folder of like name in the Photos section on my Facebook and Google+ pages.